LEFT: SIX OF WANDS REVERSED. This is the card of the Victorious Soldier, indicating success and glory after a period of struggle. When it’s upside-down, there could be a sense of over-confidence or insecurity in approaching a situation. Someone’s either too sure of themselves, or not sure at all. There’s also the possibility of jealousy and sabotage using lies, distortions, and false promises (which the Goddess Divination lot addresses) – use discernment if someone (usually a friend or co-worker) is coming across as too friendly or helpful. MIDDLE: FOUR OF WANDS REVERSED. 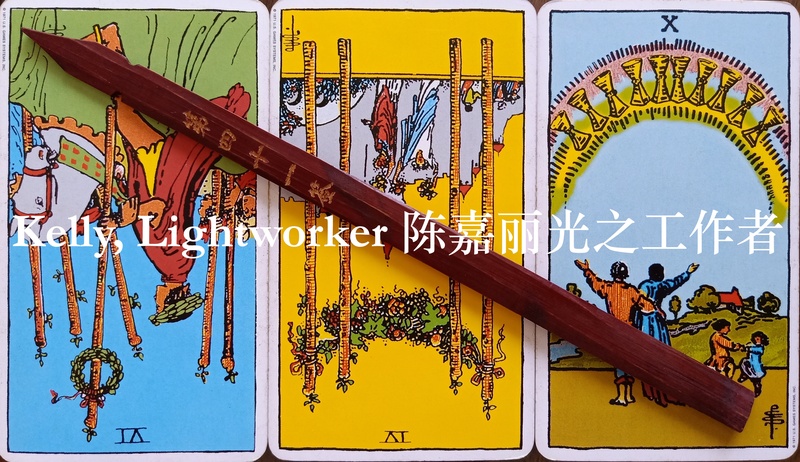 When upright, the Four of Wands is a Work in Progress card, indicating the strong possibility of positive outcomes if you stick to your plans. When reversed, this certainty is literally turned on its head. The guarantee of a happy ending is not as assured as it could be. But do we simply take our difficulties and challenges at face value? Do we assume that if it looks like nothing is happening for our benefit, we must be losing, and hence we should give up? I would advise against making such assumptions because of the final card. RIGHT: TEN OF CUPS. This is one of the best cards to get in the Tarot! The Ten of Cups is the Happy Ever After of the Tarot. It indicates emotional fulfilment and the promise of lasting joy. This card chronologically comes after the Nine of Cups, which is the Wish Come True card – this card represents the happy outcomes for you and loved ones, after all your heart’s desires have been attained. It seems to me that this week’s Tarot encourages us to stay the course, and not to be thrown off by the appearance of defeat. But neither should we allow ourselves to be deluded by arrogance or insecurity – it all starts with the willingness to see a situation for what it is, to submit to the authority of Truth, and to work things out from there. Until you treat them like your own. And you’ll regret your misguided actions. When this lot is drawn, be careful: you could be in a situation and facing a juncture where a mistake could cost you dearly. This lot depicts the parable of a person who takes in a thief as their own child, to their later regret and suffering. This week, do not be deceived by false appearances. Someone or something could make you an offer too good to be true. It probably is. The Mercury retrograde in Pisces may be over, but we’re still in the post-shadow period which ends either 16 or 17 April (depending on where you live in the world), so take absolutely no chances especially if the stakes are high. Also, be careful whom or what you trust. On the other hand, as the Tarot helpfully points out: the reverse can also be true. If you’re in a situation where nothing seems to be happening in your favour, do not lose hope in the future or confidence in yourself. Do not be deceived – either by false promises, or apparent failure. You may need to consider other options, review your methods, or wait it out – but there is nothing wrong with your overall goals, plans, and purposes. Hang tight, make corrections if necessary, but do not change course. You’ll get there in the end.